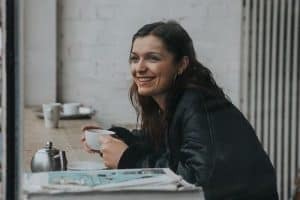 We all love a good cup of coffee; whether it is to get you going first thing in the morning, an afternoon pick-me-up, or a social catch up with friends. When you buy your coffee beans or grounds you want it to be good to the last drop. That perfect cup full of flavor and a rich, dynamic aroma can be yours whenever you please. However, that is only possible if you are careful on how you store those coffee beans or grounds between pots of coffee. They don’t last forever… and the longer they sit, the poorer the quality. There is a simple solution to keeping your coffee tasting its bestmoval may damage the contain. The type of container you use to store your coffee has a huge impact on what your next pot will taste like. By using the best coffee storage, you understand the importance behind keeping your coffee grounds or beans fresh and protected. The best way in order to store coffee and preserve the quality and flavor of the beans or grounds is in an airtight coffee container. That container should not be clear or see-through in any way. This is best used as soon as possible. The grinding action releases the flavor of the beans which means there is a small window where the flavor is at its peak. That is generally immediately after grinding. Using ground coffee much later will impact the quality of the brew. Coffee beans that have been roasted have in a way locked in the flavor. The best way to keep them in their best condition is to store roasted beans in a cool, dark location. Keep them at room temperature. Unroasted beans that you intend to use later will last longer if kept in an airtight coffee container. Keep that container in a location where the temperature and humidity are comfortable for you as well. How Long Will Coffee Stay Fresh When Stored? Provided you have stored these beans in a location where light and oxygen cannot impact them, they will stay fresh for about 15 days. Grind them only just before you plan to use them. If you kept these away from light, air and humidity fluctuations, they can last for a year or more. Green beans can dry out in low humidity or develop mold in high humidity. Can You Store Coffee In A Refrigerator or Freezer? Sure you can store coffee in either of these– if you don’t like coffee that much. Storing ground or whole coffee beans in a refrigerator is an absolute no-no. The reason for this is that in a refrigerator your coffee will be subjected to moisture. Moisture will destroy the integrity of beans and ground coffee very, very quickly. As for storing coffee in a freezer, this is still not a very good idea. Well, at least if you plan on long-term storage as the intense cold temperature is not good for coffee grounds or beans. There is an exception. You can store small quantities for use later but only in heavy-duty freezer bags and for no more than a month or two. Freezer burn can develop, ruining the coffee. What Causes Coffee To Spoil? There are four main sources of concern when storing coffee. They are light, air, moisture and heat. Anyone of these or combination of these elements will cause coffee to spoil quickly. The ultraviolet rays that come from the sun can do much more than give you a tan or sunburn. They cause a genetic mutation with coffee which attacks the chemicals that preserve flavor. When this happens, the coffee will lose its quality in taste and aroma. This is why you should store any coffee beans or grounds in a dark place or a container that is not see-through. Oxygen is as bad on your coffee as UV light. Air causes oxidization which will work to dry out the oils that occur naturally in the coffee. When this happens freshness and flavor suffer. In other words, air pretty much turns your coffee beans or grounds into dull beans or grounds. This is why your storage container must be airtight and can release CO2 from the inside. Moisture content in the air can be controlled with humidifiers which either add moisture or remove it. Too much moisture can create mold growth on coffee beans or grounds.Not enough moisture can dry beans or grounds which destroys their quality. An airtight coffee canister in normal comfortable humidity conditions will preserve the coffee for a longer period of time. Warm temperatures may keep you cozy and happy but it does the opposite to the coffee beans or grounds you are trying to keep for use later. Heat just dries them out, stripping away flavor and taste. This is why it is advisable to store coffee in an airtight coffee storage jar in a cool, dry location. The cool temperature locks in the freshness of the beans and keeps them happy. What Happens After Coffee Goes Stale? It’s not a pretty sight, to begin with. Stale coffee results from improper storage and when your grounds or beans reach this point, there is no mistaking it for something else. Stale coffee tastes bitter. Stale coffee has a bad odor. Stale coffee will stink up your kitchen when brewing. To avoid this from happening you need to use a proper storage device. What Are The Best Coffee Storage Options? Featuring a silicone seal, this container is airtight. The tinted UV-blocking plastic keeps the coffee beans or grounds from losing their flavor. The container will hold up to 1.5 quarts and includes a 1 tablespoon scoop that snaps inside the easy-catch latched lid. 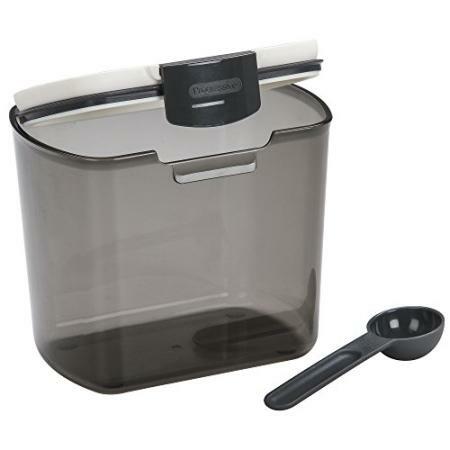 With stainless steel latches that swing wide open, this container provides full access to contents and fits easily in a dishwasher for cleaning. Dimensions are 6.5” L x 5” W x 5.5” H.
This stainless steel container was made to protect the coffee stored inside of it. This includes whole beans, ground coffee or roasted coffee beans. The patent-pending technology used in the design of this product will keep the contents safe from heat, sunlight, moisture, CO2 and air from having an impact. This keeps the coffee flavor preserved. This is accomplished with an aeration system that provides carbon dioxide to pass freely from the container. 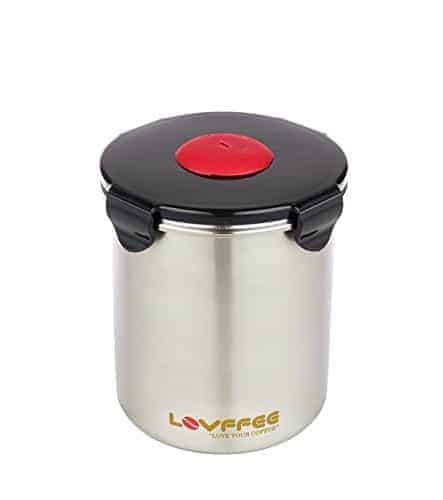 This is called Europe’s #1 vacuum sealed coffee canister and earned that status from how it maintains the aroma and rich flavor of the coffee stored inside of it. The patented system used in the design creates a partial vacuum seal and that is the secret behind how to keep your coffee fresher, longer. The design of this product also allows for multiuse. In other words, stored products can breathe and de-gas without permitting oxygen inside the container. The seal is airtight and the container has NSF and FDA certifications and approvals. It will hold 16 ounces of coffee grounds or beans. 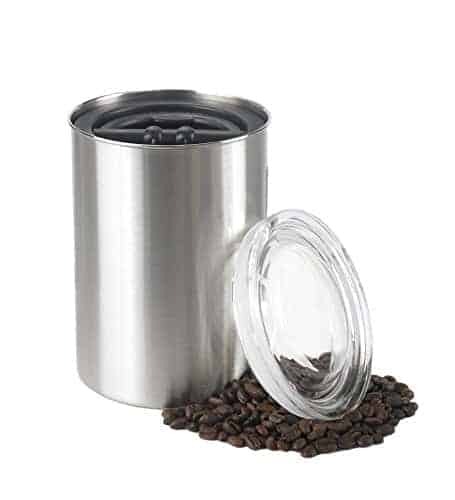 This stainless steel coffee bean storage container has a one-way valve that permits CO2 to escape but keeps light and air from entering. This keeps coffee beans and grounds fresher. The lid has a built-in wheel that you can adjust to track the expiry date of the coffee stored inside. The entire package comes with a free eBook and a $7.97 scoop at no extra charge. The manufacturer also has attached a 100% satisfaction guarantee to this canister. If you encounter a problem of any kind, the company will send you back a full refund. 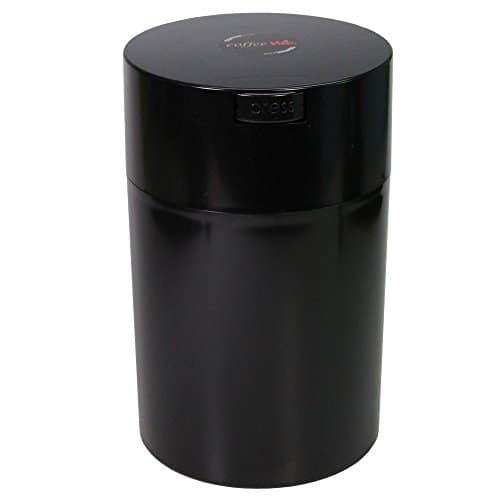 This coffee canister comes in a range of colors and small and large size options. The small holds 0.57lb / 261g and the large holds 1.2lb / 554g of coffee grounds. 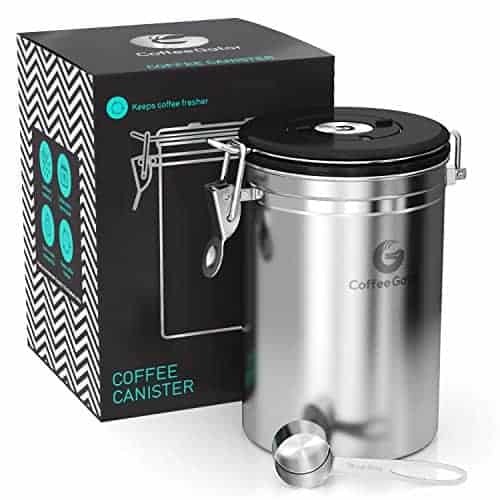 Same as the coffee storage canister above, this one is also made by Coffee Gator, but comes in a different size (medium), plus includes a mini canister, which is handy to take with you when on the road. Made from stainless steel, this container has what the manufacturer calls a ‘freshness valve’ which vents out CO2 and keeps air from going back inside. The lid contains a calendar tracking wheel so you can keep an eye on how long the beans or grounds have been stored. There’s also a free eBook and a scoop (valued at $7.97). 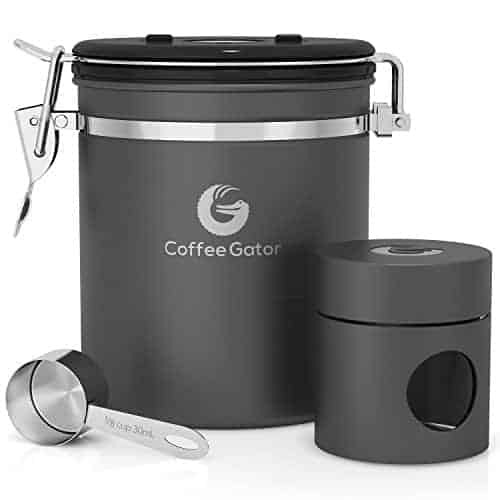 This Coffee Gator product comes with the company’s 100% satisfaction guarantee so you know that if you find something wrong with the canister, it’ll be covered or replaced. This coffee storage canister holds 0.8lb / 377g of coffee grounds. Using a patented process, this container has a valve that forces air and oxygen out and then locks the lid in place producing a solid airtight seal. It is made from restaurant-grade 18/8 stainless steel and is completed with an enamel finish. This model has a 64 fl oz capacity and is BPA free providing the best coffee storage possible. The manufacturer uses what they call a patented AirFresh Valve Technology where a valve in the lid allows one-way escape of CO2 without letting air in. 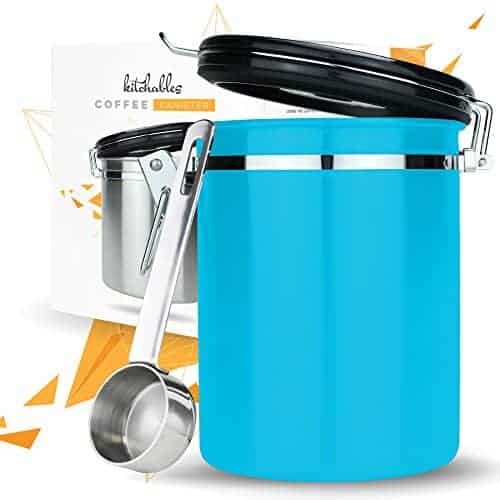 Made from stainless steel, this canister holds up to 17 ounces of coffee beans, grounds, tea bags or any other dry good. This product also comes in a variety of different colors to match your mood or décor. They include silver, lavender, blue, yellow and more. A metal scoop valued at $8 is included and a built-in calendar helps you track the age of the contents. There is also a 100% manufacturer’s warranty. If you are a serious coffee lover, you understand the importance of keeping your coffee grounds or beans fresh and protected. By using the best coffee storage protecting it from harmful elements, you reap the benefits. Well kept beans or grounds that are stored properly in an airtight container will preserve taste, flavor, and aroma. If you don’t do this, you’ll end up with stale coffee and no one wants that. We love having a good cup of coffee, so spending a bit on the best storage options is well worth the investment.